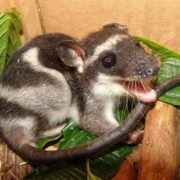 Most opossums live in forests of Central and South America. 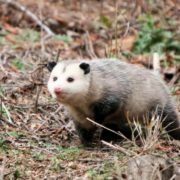 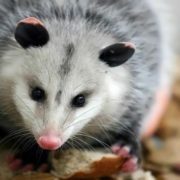 The Virginia, or common, opossum is the only marsupial found in North America. 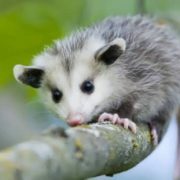 Opossums are the oldest marsupial mammals. 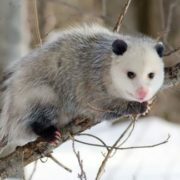 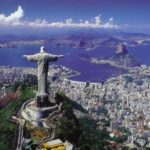 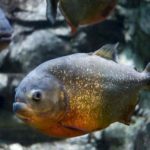 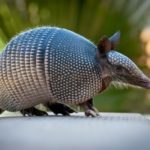 The ancestors of these animals have appeared at the end of the Cretaceous period, which ended about 66 million years ago. 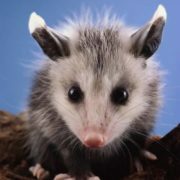 Possums were first described by Spanish chronicler of South America Pedro Cieza de Leon in 1553. 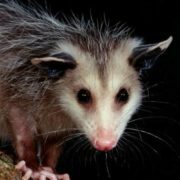 Opossums can have a body length as great as 50 cm, plus a tail (almost naked and prehensile) of up to 54 cm. 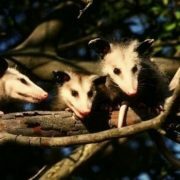 They have a long, pointy white face and beady little eyes. 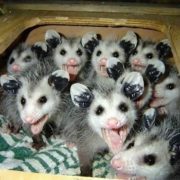 Possums have 50 teeth. 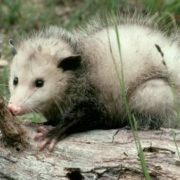 They have coarse fur that can be grayish white or nearly black. 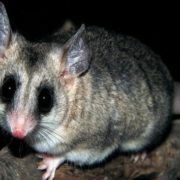 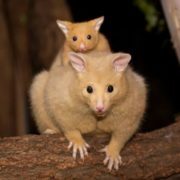 These animals live in hollow trees or under stumps and roots. 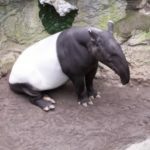 They are solitary animals, coming together only to mate. 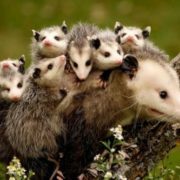 Opossums are marsupials (they are mammals carrying their young in pouches on their bellies). 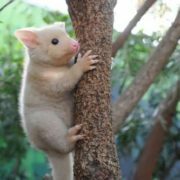 Babies are born blind. 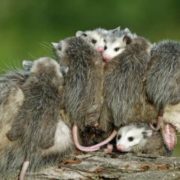 About 13 baby opossums can fit and feed inside the pouch at one time. 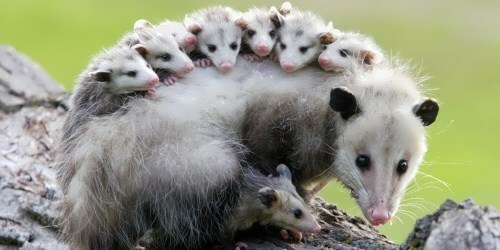 After five weeks they crawl out and ride piggyback on the mother’s back. 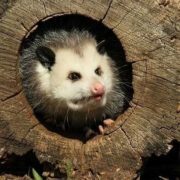 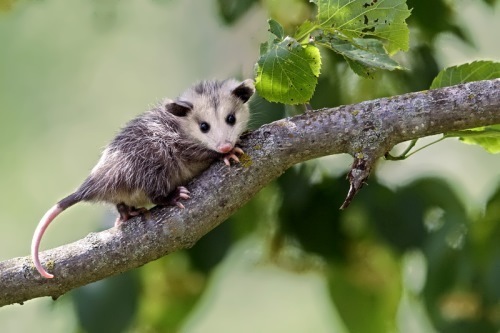 Opossums eat fruits and berries, insects, birds’ eggs, and little creatures. 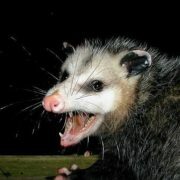 Most predatory animals like to eat live food and will lose interest in animals that are already dead. 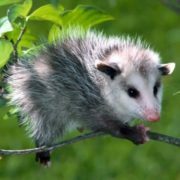 So the opossum sometimes escapes its enemies by pretending to be dead. 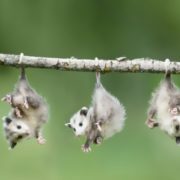 People often picture opossums hanging from tree branches by their tails. 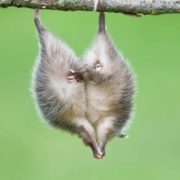 Although they wrap them around branches to help keep their balance, possums don’t actually hang by their tails. 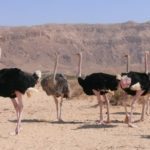 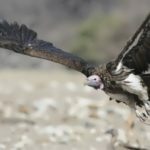 These animals live up to eight years. 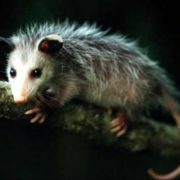 Opossums are killed for their fur. 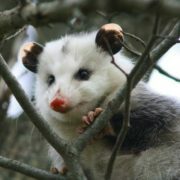 The common opossum is also eaten in some places.